I have always found it ironic that we feel most alive when our heart skips a few beats. If you don’t believe me, then you should try sky diving. 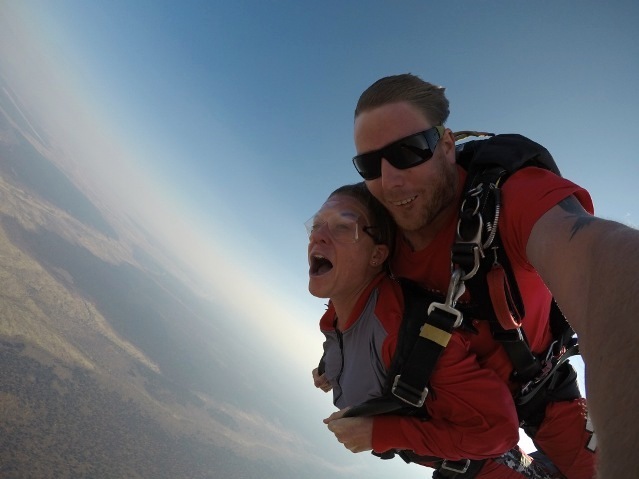 The Skydive Tandem Co (STC) have recently launched their operation in Victoria Falls, and this adrenaline activity is sure to give you a natural high. The team pioneered Tandem Skydiving in Mauritius and with thirty years of experience, they have mastered the art and developed a faultless safety record. Based in the Zambezi National Park, STC is just seven kilometres away from the majestic waterfall. In a small plane, adrenaline seekers soar 10 000 meters into the sky. Without the small plane, they make the 10 000-meter journey back. Prior to the jump, the aircraft flies over the waterfall, giving you a breath taking bird’s eye view of Devils Cataract, Main Falls, Rainbow Falls, and Horseshoe Falls. It then circles back to the drop zone in the National Park, where you will step into masses of open African air. After experiencing the rush of a 200kph free fall, a parachute is released and jumpers soar above the wilderness that stretches into the horizon. 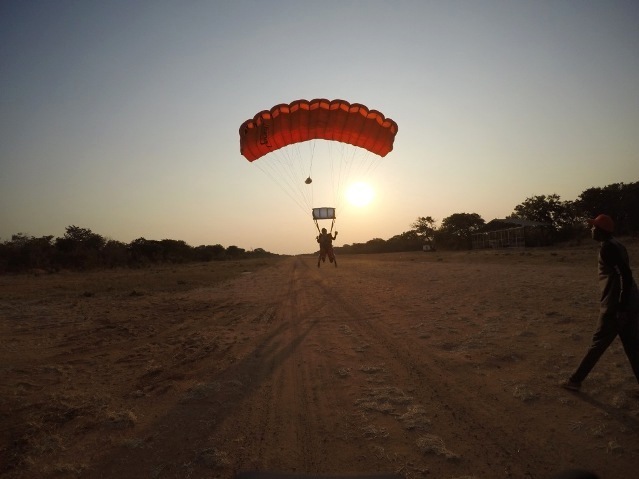 Chris Wilkinson-Pearce started the company in Victoria Falls because “Skydiving is the ultimate adventure sport, and Victoria Falls is the adventure capital of Africa”. With 4 500 skydives under his belt (yes, you read that right), safety is always at the forefront of Chris’s mind- “Tandem instructors go through a vigorous training program to ensure that Skydive passengers have the best and safest experience. The oldest person I have taken skydiving was a lady of 87. The sky is the limit”. When you ask people what their chosen superpower would be, most will tell you that they wish they could fly. I think that this is partly because when we look at the sky, we get a sense of the freedom, exhilaration and adventure opportunities that live in the blue tent above us. Once you have fallen between the clouds, you will forever look up. Victoria Falls boasts many cutting-edge activities, but this is the only one to take place on the edge of the clouds. At dawn and dusk, the sun paints the world with a red and gold brush, and STC find that this adds an extra dimension to the experience, making sunrise and sunset premium slots. The team will capture the dive on camera, and the footage is available to purchase after the jump. I guarantee that when you watch your video and look at your pictures, you will think, “I can’t believe I did that”, but you will be infinitely happy that you did. When David Livingstone first saw the waterfall, he briefly abandoned his scientific mind and said that these were sights so lovely, they must have been gazed upon by angels in their flight. If you have visited the rainforest, you have seen the wonder from Livingstone’s perspective. Now STC gives you the opportunity to see it the way the angels do. We use state of the art Sigma tandem rigs from United Parachute Technologies UPT in America. All our tandem instructors are Sigma rated by official Sigma examiners, there licenses are renewed annually with class 2 aviation medical. All equipment is thoroughly checked on a daily basis and packed by our rigger. All our equipment has mandatory AAD’s Automatic Activation Devices, which automatically release at 2 500 ft. We are the first commercial Skydiving operation in Zimbabwe licensed by Civil Aviation Authority of Zimbabwe (CAAZ) holding an Air Operators Certificate (AOC), which requires strict compliancy in Aircraft maintenance, parachute maintenances, pilot licensing and tandem instructors licenses. What is the Flight of Angels? David Livingstone, the first Caucasian to view the Falls, is reported to have said "Scenes so lovely must have been gazed upon by angels in their flight". You, like the angels, will witness the spectacular sight of the Victoria Falls from the air as you climb to your drop off altitude. From 10,000ft you will freefall for up to 45 seconds. What speeds will I reach? You will reach speeds of up to 200kph depending on body size & position during your freefall experience. What is your skydiving equipment like & how good is your safety record? The whole experience can be done in 1.5 hours. We do ask you to allow yourselves up to 2 hours though, as due to weather conditions or other unforeseen circumstances times may vary throughout the day. I wear glasses or contact lenses - is this ok? YES! We have goggles specially designed to fit over prescription glasses. If you wear contact lenses we suggest you bring your contact solution just in case your lenses dry out. Can I take my camera on the plane or on the skydive with me? You may NOT take any form of camera on the skydive or in the plane with you. This includes Go Pro cameras. What do I have to bring and what clothing is suitable? All you need to bring is yourself and your sense of adventure! As far as clothing is concerned you need to wear closed shoes - that won't come off in freefall! Bring a sweater just in case - Victoria Falls is usually warm/hot all year round. We provide you with a jumpsuit and goggles. The general weight limit is 95kg. However, since our tandem instructors are light it is possible to take clients up to a maximum of 110kg. The final decision will be based on your fitness level and will be at the discretion of your qualified instructor. Anybody weighing 96 - 110kg will pay an extra $50. These fees are due to the increase in costs involved in taking a heavier weight. The whole experience can be done in 1.5 hours. We do ask you to allow yourselves up to 2 hours though, as due to weather conditions or other unforeseen circumstances, times may vary throughout the day. Can someone with a disability go skydiving? Most people should be able to experience the thrill of tandem skydiving. Using a specially made harness designed and tested by Jezza Williams (himself a tetraplegic), our staff are experienced in sharing the sky with people with most disabilities. Safety of our customers and staff is paramount and we will only accept individuals on a case by case basis. Participation is conditional on the judgement of our operations staff.